About the River: Rafting on the North Fork American river is only available only during the spring and early summer, typically April and May. Starting as a mild stream, the North Fork of the American River and the most difficult of all the forks of the American, quickly gathers momentum and enters the class IV “Chamberlain Falls Gorge”. Here the river drops through a very steep gorge between house-sized boulders and over waterfalls that reach eight feet in height. Crystal clear water and rapids that seem endless are the trademark of this technical, challenging river. This is one of the most beautiful rivers in the Sierras and should be attempted only by adventurous first timers with good swimming ability and who are in good physical condition. Wet suits are a must for this trip and are included when you raft with us. 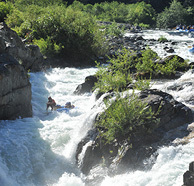 We offer half-day, 1-day, and 2-day whitewater rafting trips on the North Fork of the American River. “Tongue and Grove”: rock jumbles clog the river – do we go left or center? 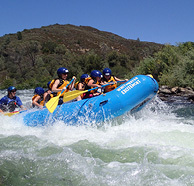 When is the best time to go river rafting – North Fork American river rafting is a springtime adventure. We raft on the snowmelt from high in the Sierra Nevada mountains. 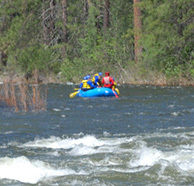 March through May is prime time for rafting the North Fork American river when the river is flowing high and clear. Depending on the snowpack, as the North Fork is a free flowing river (no hydro-electric dams), this river could last until the end of June. Normally, however, by mid-late May the river is reduced to levels not recommended for rafting. Scroll below to see our full list of standard trips on the North Fork. 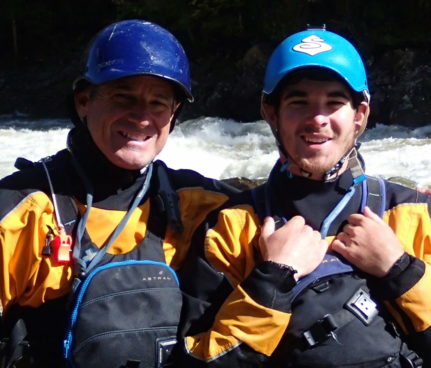 Ready to book your rafting trip on the North Fork American River? Reserve your trip dates directly by booking online. Fill out our online trip availability form and receive a response within 24 hours with more options and details. Rafting the North Fork American from Whitewater Excitement on Vimeo.